DIY Wall Easel - Easy + Affordable + Adjustable! If you follow me on Instagram you may know that I recently shifted my workspace from the living room, kitchen, bathroom (pretty much anywhere I could find space), to a newly remodeled 6x9 foot room in my little house. Don't get me wrong, I so appreciate having a designated space now... but it's really difficult to work on large paintings in a room that's crowded with art supplies and is too small for a floor easel. I usually end up trying to paint with a canvas flat on the floor or propped low against a wall, which leaves me with an awful headache/neckache every single time. So, last week I decided enough was enough: painting at eye level while standing or sitting = necessity. Enter adjustable wall easel. 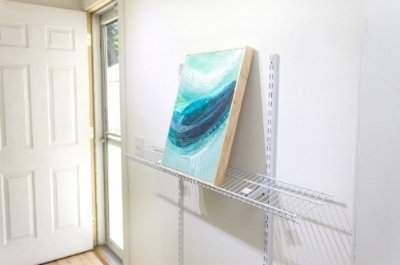 Except, if you hunt for decent wall easels online, they can cost HUNDREDS of dollars and most sit flush against the wall. I don't know about you, but I prefer a slight angle when I'm painting. It's more like working on a traditional easel and means I don't have to secure the top. Thinking about this easel was so much fun. I'm geekily excited about it even if it is only wire shelving wearing new pants. Goals: affordable, easy to install, adjustable height so I can sit or stand, possibility of adding palette/tool shelf, parts available locally. MISSION ACCOMPLISHED! Quit yammering and give me the tutorial, right? You got it! Click on the image below and you'll be able to print or download the PDF. After you've read through the tutorial, feel free to come back here to ask any questions. Did you make an easel based on this design? I'd love to see it or hear about your modifications. Also, a new canvas framing tutorial is coming up, so check the blog again soon!